and for freedom and dignity for all women. anchored to this community for three years. 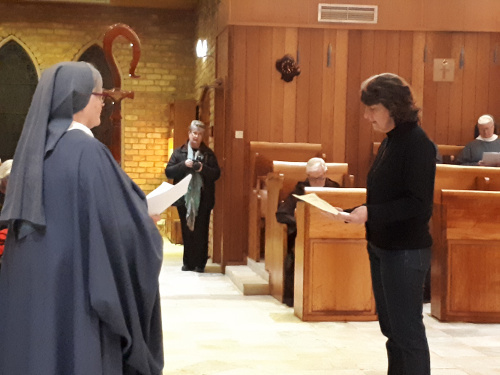 With these words, our friend and Oblate, Lee-Ann Wein, made her simple vows to God as a Beguine during Vespers on the Feast of the Visitation at the Abbey. Friends and family came to the Abbey that evening to join the community in witnessing this wonderful ceremony and all of us were deeply moved by her words and commitment. Many of you will wonder what a Beguine is. To help us understand more about them and her own call to this way of life today, Lee-Ann has written the following article for us all. At its conclusion, she speaks of having “800 years of women standing with her”. I am sure that after reading her reflection, she can be assured of the support and prayers of many hundreds more – women as well as men! 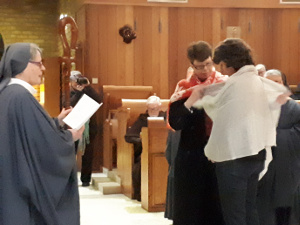 Our congratulations to Lee-Ann on taking this new step in her life’s journey and blessings, rich, warm and wild, for the future! “Question: What could a lay woman from the 12th century possibly have in common with a lay woman in 2018? Answer: A movement of women called Beguines. Beguines were committed lay women who followed this way of life from 12th century until quite recent times, mostly in Europe. They were women who chose an alternative to marriage or religious life. They lived simple, contemplative lives of service. They made personal vows or promises rather than the canonical vows that married women or nuns make. Initially they lived alone or in small communities. Their numbers grew and for safety they lived in large communities called Beguinages. By the 15th century one of these Beguinages housed 2000 women. They were artisans, women of wisdom and many were mystics. If you study the Spiritual Classics today, you may read Marguerite Porette’s work The Mirror of Simple Souls. She was imprisoned and burnt at the stake for these words. The church in the middle ages was wealthy and powerful with little outreach to the poor. A large part of Beguine life was living the vita apostolica ? apostolic life ? in caring for the socially marginalised, the sick and the destitute. These women were the first nurses, midwives and teachers. They were often called on to sit with the dying, prepare the body for burial and attend the funeral. They cared for lepers and created the first hospices. In the large Beguinages they had The Table of the Holy Spirit, which was similar to our Vinnies conferences. They took particular care of women. Five years ago I came to live at the Benedictine Abbey at Jamberoo and work in the Sisters’ candle-making business. At this time I read Laura Swan’s Book The Wisdom of the Beguines: The Forgotten Story of a Medieval Women’s Movement and found it fascinating. After reading it again recently, I felt I had found some kindred spirits. I wondered if it were possible that I could be one of these women. Before his episcopal ordination, Bishop Brian Mascord made a retreat here at the Abbey. After listening to him describe the deep trust it took for him to say ‘yes’ to this new calling, I felt inspired to follow what I was hearing within me and begin a discussion with the Abbey community. The community is open to supporting new expressions of commitment within the Church, and has chosen to stand with me in my commitment to become a Beguine. I am a Hunter Valley girl, educated at St Mary’s and St Peter’s High Schools, Maitland. I have been a veterinary nurse and a funeral director. 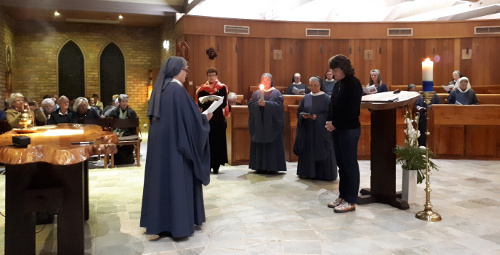 I have spent time in initial formation with the Sisters of St Joseph, Lochinvar and the Benedictine Nuns of Jamberoo. 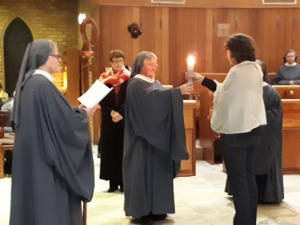 The excellent formation I received in religious life has provided a framework for me to formulate my life values and personal vows as a Beguine. 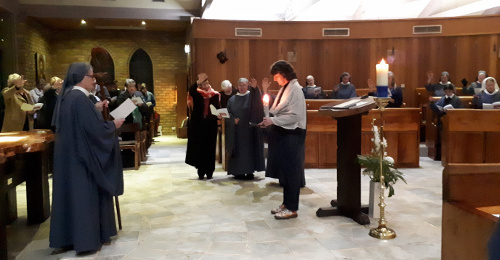 Service of Praying Compline (night prayer) for all survivors of sexual abuse and for freedom and dignity for all women. In living simply I endeavour to practise conscious consumerism out of respect for others and our planet, to recycle and repurpose, to choose ethically made products and to avoid large corporate entities in favour of local community. In living Contemplative Listening, I honour my desire for wholeness by committing to personal and spiritual growth through reading, prayer, and solitude, taking the Rule of St Benedict as my guide. The vow of service is the most important part for me. According to Our Watch (www.ourwatch.org.au) one woman dies each week in Australia due to male violence. According to the Association of Child Welfare Agencies, each week more than 60 children are placed in care because home isn’t a safe place. Child sexual abuse affects some 1 in 3 girls. This is why I pray. As a survivor of childhood sexual abuse, I have valued someone holding the light for me in my recovery from my trauma. My Compline prayer for survivors and for women is my way of holding the light for others. Thank you for sharing this moving account with us Lee-Ann.